You know how frustrating it is when you push your lawn mower to the front yard, pull the starter cord and nothing happens? Because the thing is totally out of gas? 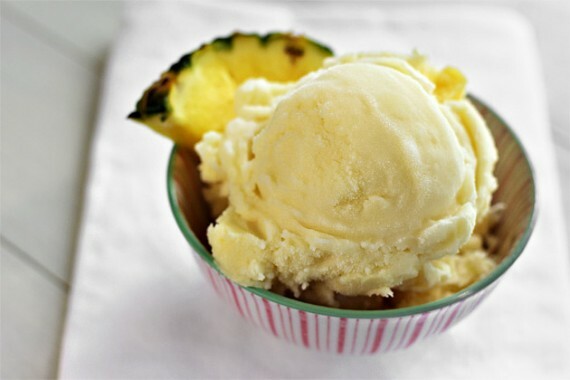 Which means it’s a perfect day for a recipe that’s barely a recipe, like this Piña Colada Sorbet. Preferably with a splash of rum. This recipe is so simple, it might make you suspicious. I mean, two of the ingredients come in a can! What? You just stir together some pineapple juice, cream of coconut and lime juice, pour the mixture into your ice cream maker, and freeze it. Bang, boom, voila! And, as a reward for all of that non-effort, you get this icy, creamy, bright and fruity concoction that will take your puddin’ brain to a tropical paradise. It’s delicious alone or with slices of fresh tropical fruit, but if you want to take the experience completely over the top, blend the sorbet with your favorite rum for a slushy piña colada. It might not heal your brain, but it can do magical things for your limbo. Serve this sorbet with tropical fruits. Or, scoop it into a glass, douse it with rum, and serve as a slushy cocktail.